In order to send any outbound messages from your Outbound Automation system, you must set up a campaign and configure it to your specifications. Part 1 of the campaign setup requires you to name your campaign and select a campaign type. Dynamic campaigns send to contacts in real-time as they automatically enter your boberdoo system in real-time based on a set of criteria you define. Click Save and Continue to advance. The next step in creating a campaign is adding a list. You have the option to create a new list or use one or more pre-created lists. To learn how to create a Dynamic List, click here. Once your list is created, it will automatically be added to this campaign. You also have the option to add additional lists to this campaign. To add additional pre-created lists, click the blue arrow next to the existing list(s) you would like to add. To create a new list to add to this campaign, click the Add New List button at the bottom. Once you have finished adding your lists to this campaign, click finish to proceed. Next, you must select the metrics you would like to track. We highly recommend tracking Email Opens and Email Clicks for every campaign. If you do not, your reports as well as your end goal tracking will not record correctly. Your third option is to generate a tracking pixel. If your end goal is Page View or Pixel Fire, you must select Yes for this option. Once you do, you will have the option to track revenue for the pixel. Click Yes to track revenue and associate a hardcoded revenue value for the pixel fire. This step specifies which tracking code you are using to track things such as clicks in this campaign. Make sure Amazon S3 is selected and click Next Step. If you chose to generate a tracking pixel in the Tracking Metrics step, this step will generate a conversion pixel for you to place on the appropriate page. Finally, select your Action Upon End Goal. This action will take place once the lead completes the end goal, which will also shut off all subsequent events in the campaign for the converted contact. To do nothing and simply end the campaign for the contact, choose End Campaign. To move the contact to a new list (where they could potentially be added to a new campaign), select one of your pre-created lists from the table. When the end goal is completed, you also have the option to enable a Reprocess of the lead that completed the end goal. When selected, you are prompted to select a source to associate with the reprocess. When the lead completes the end goal, the system will grab the original lead information and re-insert the lead as a unique lead coming from the source you select. This allows your system to reprocess this lead as a unique lead ID and attempt to match it to any available buyers. Click Save Campaign Outcomes to continue. 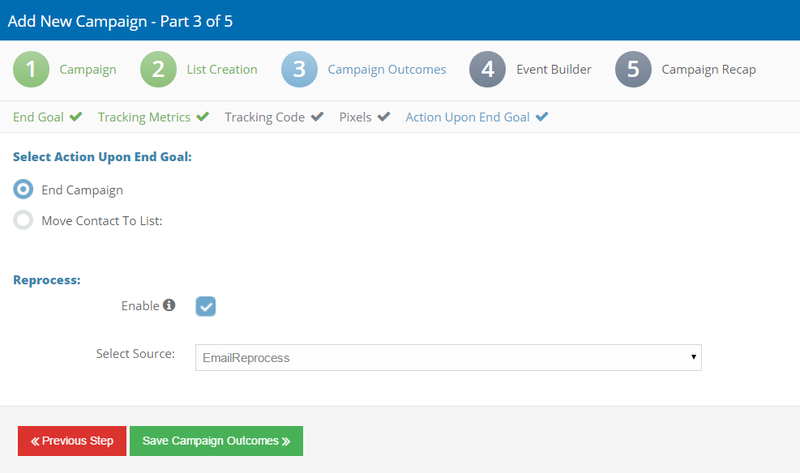 The Event Builder step allows you to create the actual events that you will send for this campaign or to select a pre-created creative to use. To learn how to build an Email creative, click here. Once your creative is built and added to the campaign, you must choose an Event Trigger. The trigger tells the system exactly when to send your individual creative. For the first event in a drip campaign, your only trigger options are Send Immediately and Delay. Note: For dynamic campaigns, the delay for Event 1 starts counting once the lead enters the list. For all additional events in the campaign, the delay is counted from the time the previous event is sent. For each additional event you add to your campaign, you will have a few additional event trigger options. Because the contact has already received at least one email, you can trigger subsequent events when the contact opens the email (Email Open), clicks on a link within the email (Email Click) or reaches a specific page and fires a pixel (Pixel Fire, Page View). Your next step is to select the ESPs through which to send the email. If you have multiple ESPs integrated into your system, you can select as many as you would like to send for this particular event. Click next step. 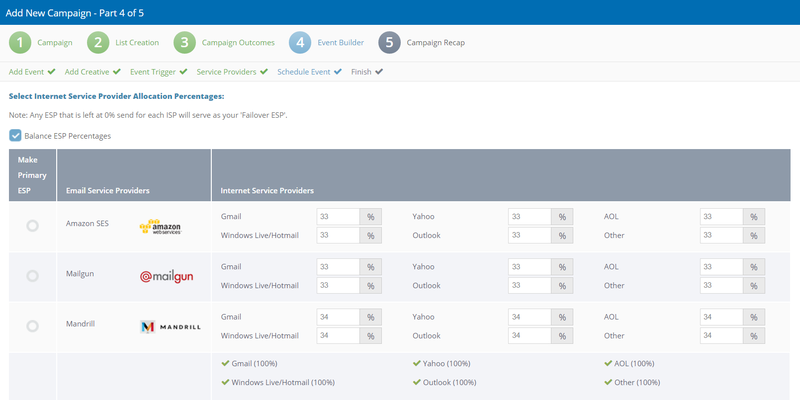 Next you must define the percentage of emails you’d like to send from each ESP to each ISP. If you are using only 1 ESP, you can skip this step. If you are using multiple ESPs, you must complete this table, ensuring that each ISP at the bottom of the table totals to 100%. Next, you have the option to specify the specific hours and days to send the event. If you use either of these options, the event will wait to send until it qualifies for your specified hours and days to send. For example, if you only want an email to send between 8am and 5pm on Monday-Friday, but a lead enters the campaign on Saturday, the event will not send until Monday at 8am. If you want your event to send at any time and on any day, you do not need to use this tool. By default, every event will send at any time on any day. Your event is now created. You can view a summary of the event by clicking the expand arrow. Next, you have the option to add as many additional events to this drip as you would like. To create event two, click Add New Event. If you do not want to add any additional events to this campaign or have already built your campaign to your specifications, click next step. Finally, the Campaign Recap step shows you all of the specifics of the campaign you have constructed. Use the expand arrows to view the details of each event in the drip. If you need to make any changes to your campaign, use the navigation tool at the top of the screen. Once you are satisfied with your campaign, click Save Campaign. Your campaign is now created, but saved in a Paused status. No events can be sent to your list(s) of contacts until you activate your campaign. However, once you activate your campaign, you cannot go back and make edits. Once you are sure your campaign is built to your liking, click the Pause button to activate it.